Linda first told me about What Happens When back in January before it was even an installation in Nolita. I hadn't heard much about it, so I decided to do a little research. I had found out that it would be "a temporary restaurant installation that transforms every 30 days for 9 months, offering guests an ever-changing culinary, visual and sound experience." At this point in time, the concept of pop-up shops and restaurants still seemed quite novel for me as I had heard a bunch of fashion designers had started pop-ups in foreign cities like London to see if their brands would do well there. I also heard a few food-related pop-ups happening around the holidays, but little did I know it would turn into such a crazy trend in the culinary world (e.g., the JBF LTD dinner I attended featuring Chef Laurent Gras). But What Happens When would be an entirely different pop-up from the ones I've heard about and are currently operating in New York City. It sells itself as a restaurant that will "never be the same place twice" and a "playground for food" in that the entire restaurant--food, décor, design, ambiance, photography, and music--will do complete 180s and continue to transform through the end of the year in December. This "delicious exhibition," to which the in-house team refers the restaurant, a result of the collaboration between one chef (John Fraser of the famed Dovetail), two designers (brand: Emilie Baltz of B A L T Z Works, interiors: Elle Kunnos de Voss of The Metrics), a photographer, and a composer. "What happens when you actually get to make the restaurant you've always wanted to make? What happens when you do it without the big investors, long leases and fancy furniture? What happens when you begin from the most fundamental thing that ties us all together: sharing food? 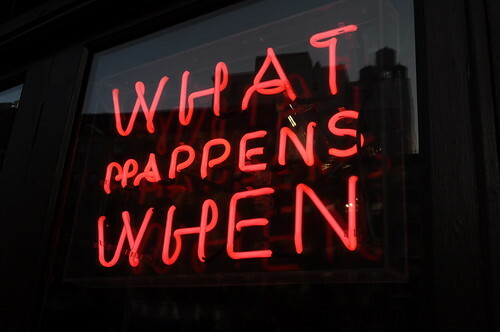 And what happens when you get to do it over and over again? While sharing the process with the very people who come to your table?" Then, the What Happens When project was born! Here's the restaurant's neon-emblazoned signage! The ingredients for the project called for "one abandoned restaurant plus one chef, two designers, one composer, and one photographer" (mentioned previously) bringing about a "process" that is inspired by the project backers gathered together via Kickstarter, the largest funding platform for creative projects in the world. This holds true to one of the "what happens when" questions--no big investors, but rather the general public! 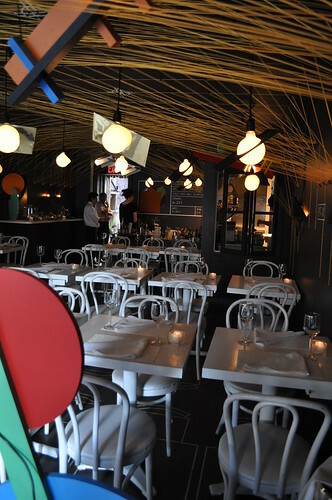 They set the pledged fundraising goal of $20,000 on Kickstarter which would ultimately fund the restaurant's operations over the course of its nine-month life (interesting note--the period of nine months is dictated by the lease held by Chef Fraser). Each month will have a totally new theme that is inspired by the suggestions provided by the Kickstarter backers. The creative team felt Kickstarter "parallels their own collaborative spirit," and further "celebrating this ethos that with every pledge, regardless of dollar amount," they requested that a theme suggestion be included for one Movement of the restaurant. They encouraged creativity in this respect, in that it could be anything that is based off of a meaningful personal food memory. Through Kickstarter, What Happens When was able to fundraise a little over $24,000, approximately 121% of their original goal! Here is the exterior of the once abandoned restaurant that the What Happens When creative team transformed into not just a functioning business but also a wonderful display of creative interpretation of the given Movement at the time--like separate museum exhibitions, showing for only one month at a time. With each monthly Movement, there will also be an individual "collection" to go with it, which includes cuisine (i.e., a menu and drinks), space design, music (i.e., soundscape), and photography (i.e., a series of new photographs). Even the service team's outfits will change! Here, the creative team will work collaboratively around the said theme for the Movement, to "transform both the space and the menu into a new dining experience." The inspiration for the term "Movement" at What Happens When is a "new way of interpreting the seasons that goes beyond just the food"--touching on all five senses and "create experiences that not only support but celebrate the menu." Movement No. 1 (top left) focused around a "new beginning" with a play on "contrasts" as illustrated by the logo of black and white--what the creators referred to as "contrast coming together to form a whole." 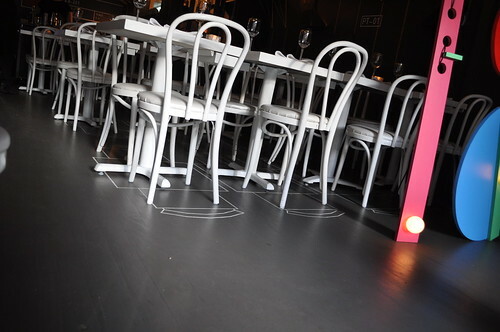 This concept was embraced in the sound and space of the restaurant as well. Movement No. 2 (top center) was inspired by a Kickstarter patron, Becky Fitzhugh, who shared her childhood memory of hunting down special comfort foods in winter. The creative team focused on this theme by "pushed the fantasy of hunting through winter while bits of spring peek through to new heights"--they created a "fantastical forest" made using oversized pine needles and hidden animal tracks matched with jungle beats by Geek Squad and imaginative, hearty winter flavors by Chef Fraser. Movement No. 3 (top right) drew its inspiration from a well-renowned 1881 painting by Pierre-Auguste Renoir entitled Le déjeuner des canotiers (French for "Luncheon of the Boating Party") from the Impressionist era. The creators made this Movement "about taking a trip together into the 1880s France via 2011 New York." The interiors attempted "to re-create an intimate, communal experience reminiscent of 19th century time and place," and the ambient music was composed by Ball of Flame Shoot Fire which is "a dense collage of French music from the thirteenth through the twenty-first century." The menu found its influences from nineteenth century France as well. As for the remaining Movements (with the exception of No. 4, which I will discuss shortly), they each will be revealed as the restaurant begins to transition to a new Movement at the start of each month. Before I get into the details of our Movement No. 4 dinner at What Happens When, I wanted to introduce the chef of the hour. Prior to collaborating with the creative team at What Happens When, Chef Fraser has worked in the famed gastronomic cities of Los Angeles (Cocco Pazzo and Raffles L'Ermitage Beverly Hills), Yountville (The French Laundry), and Paris (Taillevent and Maison Blanche). When he arrived in New York, he opened a Greek trattoria called Snack Taverna and also became the Executive Chef of Compass. 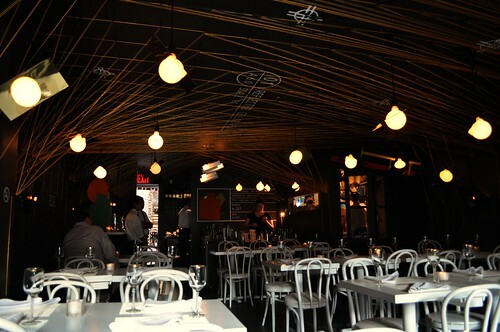 He later opened Dovetail, where he is both the chef and proprietor. Movement No. 4 (middle right) was the Movement for which our party of six (me, Marcus, Linda, John, Jess, and John--yes, another!) was able to dine this past Thursday night. This Movement is inspired by Jazz, exploring the "tension between improvisation and tradition, as well as the unique rhythm and architecture that defines this musical form." 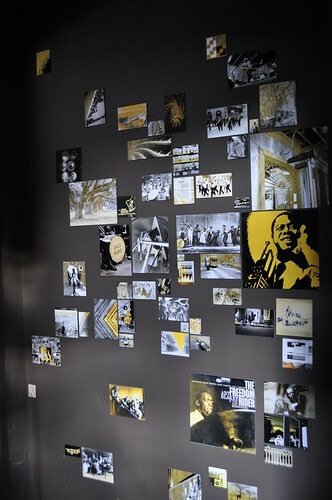 For the restaurant's entryway, this collage of "patterns and imagery that mix old photographs from New Orleans with abstract patterns that visually represent the tempo of jazz" welcomes guests with a "taste of what's to come," from both a visual perspective as well as a culinary one. The creative team played with "spatial rhythm throughout the room results in a visual cadence from the entrance all the way to the back that visually and spatially communicates the rhythm and contrast of Jazz." 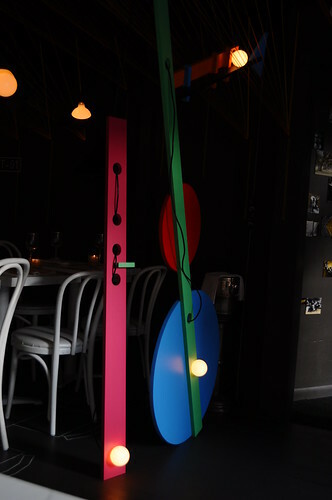 This abstract sculpture, along with the light fixtures, are inspired by jazz line up instruments. The use of basic geometric shapes and bold colors, by the creative team, add to the "visual symphony." The floors are lined with guidelines as to where to put the dining fixtures. 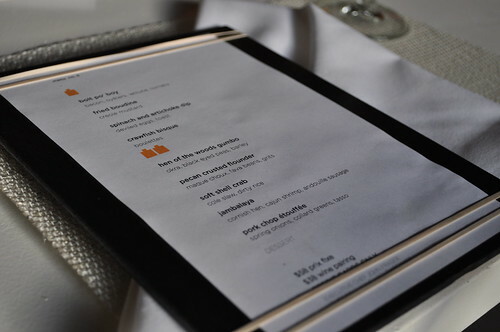 The menu was rubberbanded onto a hard rectangular surface. All the background I mentioned above, shared by the restaurant's website, appears on the opposite side of the menu as well. As for the menu's contents, they pay homage to the birthplace of America Jazz (i.e., New Orleans), from where it derives its flavors and ingredients. The soundscape is compiled by Diallo Riddle, a disc jockey who "mixes New Orleans Jazz with modern notes, referencing the city and surrounding innovation of when this musical form" was born. 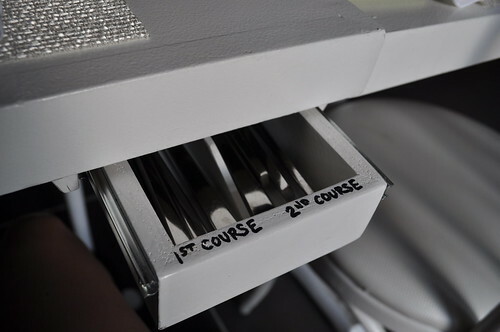 At each table, they had flatware in these little drawers, which two assigned compartments to the first and second courses. We started off the night with a round of New Orleans-inspired cocktails, with big thanks to Jeremy (a friend of the wonderful group I was with). Two of us (including John P. and myself) went with the Prospero which was What Happens When's take on the New Orleans classic drink, the Hurricane, even in its appropriate glassware! The classic Hurricane cocktail contains fruit juice, syrup/grenadine, and rum. 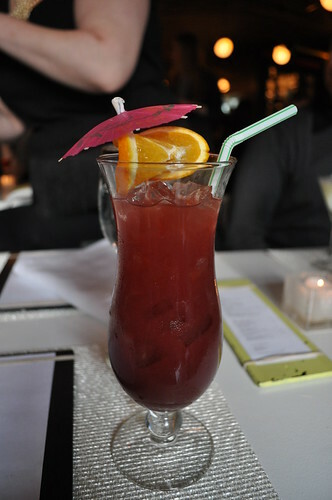 This particular twist on the Hurricane contained pomegranate juice and other assorted fruit juices. I thought it was great--a very classy take on the French Quarter staple. 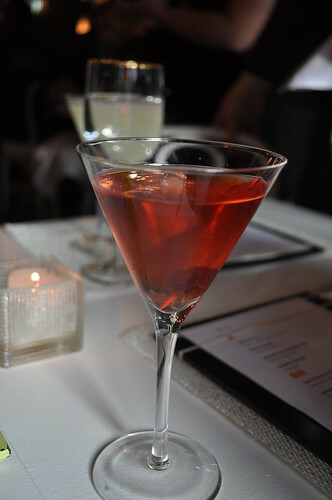 The flavors here were a bit more refined, and it tasted to me like a spiked Juicy Juice box! Delicious but lethal--in the best way possible! John S. (Linda's husband) and Marcus went with the Ferdinand which was What Happens When's take on the Ramos gin fizz cocktail. 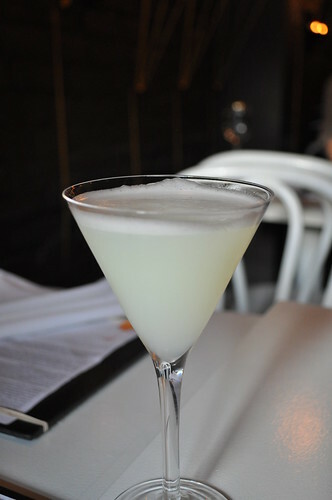 It was a concoction of gin, orange flower water, and egg white. I had a sip of Marcus's and I found this to be very strong and biting. If you like a hard cocktail to knock some sense into you, this may very well be it. Powerful flavors of gin, citrus, and creaminess. Linda and Jess went with the Caliban, which was the Cajun version of the Manhattan cocktail. 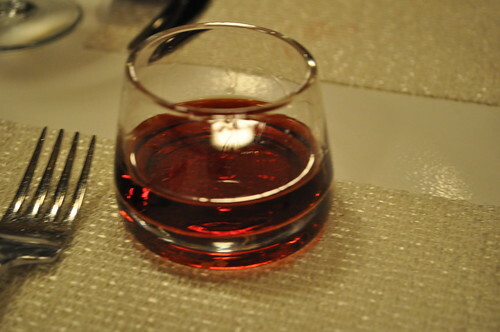 It contained bacon-infused bourbon (yes, you did read me correctedly--bacon, indeed), maple syrup, and Tabasco. The infusion of bacon led to the continuous discussion through the rest of the night about how bacon has this uncanny ability to make any dish or drink for consumption better. The cocktail was a balanced combination of smoky and spicy--there was this lovely aftertaste on the tip of your tongue that nearly left you salivating for more bacon. The little thing at the bottom of the cocktail was a cherry, though I had initially told Linda and Jess that I thought it was bacon. This led to a group discussion about how cherries stuffed with bacon would taste amazing. I'm very committed to trying that, too! After cocktails, the restaurant began our meal with two amuses-bouche. On the right is a miniature muffuletta sandwich, the signature sandwich of New Orleans. It is served on ciabatta bread with marinated olive salad, layers of capicola (i.e., a spicy pork cold cut), salami, pepperoni, The loaf is then covered with a marinated olive salad and pistachios, then layers of capicola, salami, pepperoni, Emmentaler (i.e., a Swiss cheese), ham, and provolone. There was a dab of garlic mayonnaise on top. It was a pretty good tasting sandwich, but none of us really thought it stood out all that much. It seemed like an ordinary Italian submarine sandwich, only in miniature. 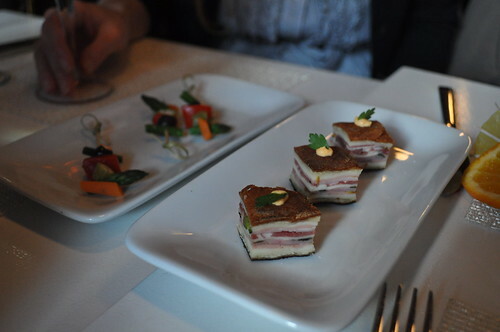 The amuse-bouche on the left were pickled vegetables on bamboo toothpicks. They were refreshing and crisp, but again, nothing to write home about. 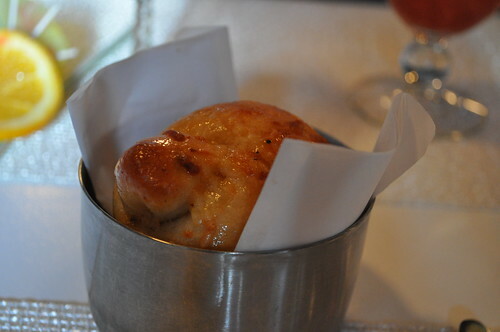 As for the bread, the restaurant offered cajun bread, which we all agreed tasted like a slightly spicier garlic knot. We all also opted for the wine pairing with dinner. I tried to snap quick photos of the bottles, but I wasn't quick enough to get all of them. I'll leave the names out, but overall, the wine pairing was pretty solid--nothing that was hard to drink with each course. For the first course, everyone (except myself) ordered the fried boudine with creole mustard. Inside each boudine contained pork shoulder meat added to rice, which was then battered up to be fried. It was seriously boudine-mania at our table. Many balls, indeed. The bite I stole from Marcus's plate was pretty flavorful--that creole mustard was really great--but I found the boudine to be a little dry. Since everyone else seemed to enjoy the meat of pork shoulder enveloped in these fried rice balls very much, I assume my bite wasn't very representative of the population. 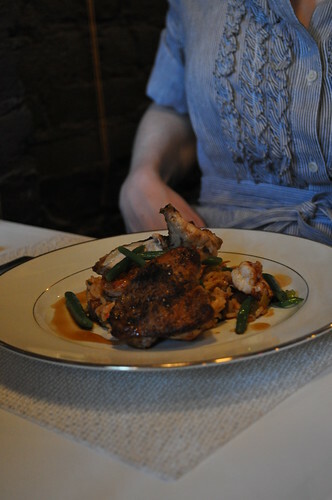 As such, the consensus was A+ for the fried boudine! I have this thing about trying to order menu items that are different from what everyone else in your party ordered. It seemed everyone had their eye on the fried boudine (as I've already mentioned), and for that reason, I decided to start my meal with the crawfish bisque. I loved how the crawfish meat is prepared separately from the bisque itself, and when served, the bisque is poured right in with the crawfish--this ensures that the crawfish stays intact (i.e., in its whole chunks) and is not overcooked when the bisque is prepared and cooked. I found the bisque to have a really balanced consistency--the right balance between thick and brothy. The flavors were many--creamy, ideal saltiness, fragrant from the wine used in preparation, and a little spicy. The added cream on top balanced these strong flavors out with its soft, smooth texture and taste. The portion was a notable size in that I didn't feel overstuffed with soup nor did I feel like there wasn't enough. 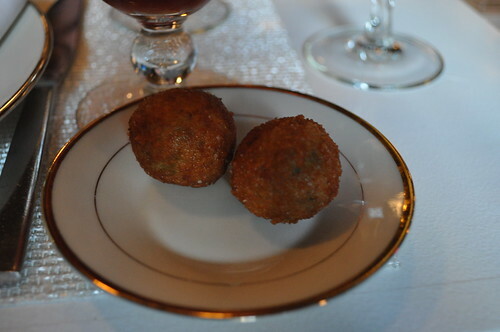 Two boulettes (French for "little balls") were served alongside the crawfish bisque, which were deep fried using crushed crawfish head meat. I dipped these into the soup, and it was really, really good. I found them to be slightly oversalted, but I'm fussier than most when it comes to oversalting, so it's probably just the righta mount. They were bleeding with crawfish flavor--the rice absorbed all of that delicious flavor! Then we began our main courses. 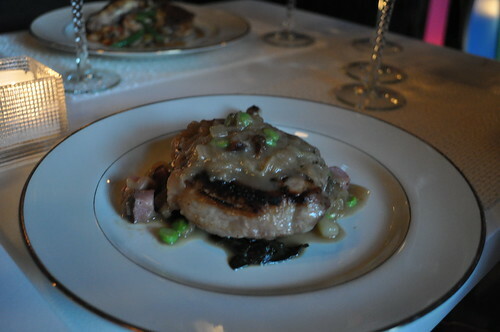 Linda and John P. had the pork chop étouffée served with spring onions, collard greens, and tasso. They found it to be just okay--nothing out of the ordinary. In fact, Linda found hers to be overdone, and John founds his to be a little underdone. Marcus, Jess, and John S. had the jambalaya, which had cornish hen, cajun shrimp, and andouille sausage. The dish was really spicy (just as jambalaya is supposed to be in nature). For Marcus, the chicken was slightly overcooked, making it hard to cut off the bone, but the shrimp salvaged this with its punchy and succulent flavor, outstanding from the jambalaya's other ingredients. 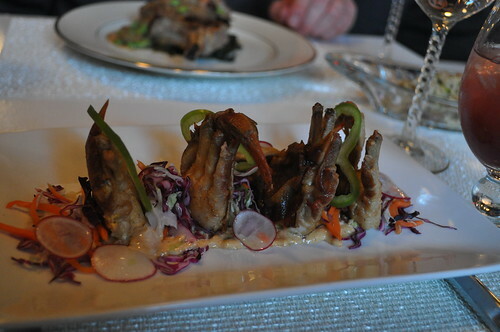 I, again, wanted to be different from everyone else and went with the soft shell crab served with cole slaw. I really, really enjoyed this dish--it was probably my favorite course from Movement No. 4! The crab was delicately soft with a crisp, cooked shell. The loose housemade cole slaw went really well with the crab, adding another dimension of crunch each bite. I think there was some kind of garlic mayonnaise spread on the surface of the plate, with the soft shell crab and cole slaw resting on top. 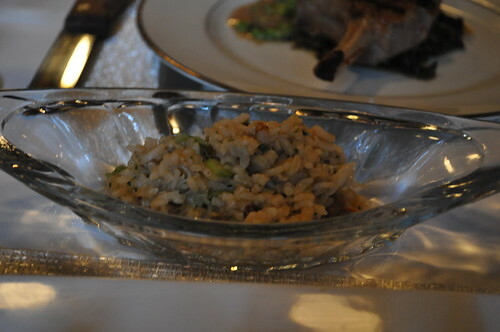 "Dirty rice" was also served alongside the soft shell crab. Typically, it is a traditional Cajun dish made from white rice cooked with small pieces of chicken liver or giblets that give it a dark ("dirty") color and a mild but distinctive flavor. Similar to a pilaf, it also includes green bell pepper, celery and onion (also known as the "holy trinity"). The rice was pretty good, but I guess I expected as much flavor as the rice found in the traditional jambalaya dish. I also felt that the soft shell crab and the dirty rice seemed a little bit much in that I wasn't sure if I was supposed to eat the rice as a side or alongside my bites of soft shell crab and cole slaw. It just seemed really separate--not at all as a cohesive side, the way the cole slaw interacted with the crab. 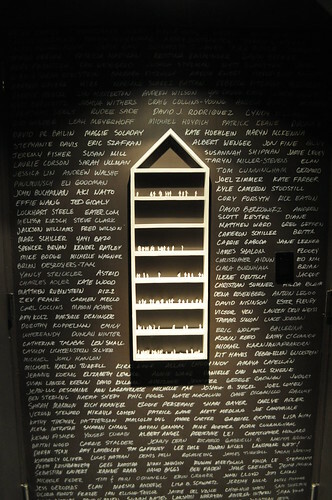 While we were waiting for dessert, I went looking for the wall at What Happens When with all the names of its Kickstarter backers. 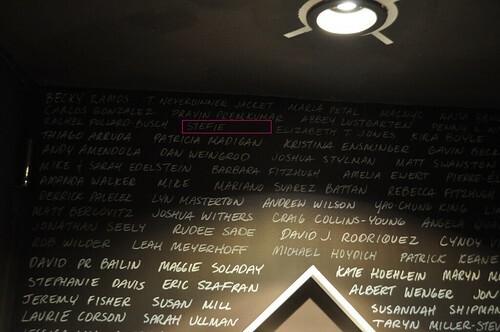 One of the "incentives" to donating $5 or more to What Happens When and its nine-month operation was that you'd see your name on one of the walls in the restaurant. Here's one of the walls! The other wall is to my right, unseen in the photograph. I had seen a photograph of the wall on What Happens When's Kickstarter "Updates" page--it has the chalk-on-blackboard effect! After attempted to peruse the wall for my name on my own, I still couldn't find it! Luckily, Jess pointed me in the right direction, i.e., the top left, as pictured here in the pink rectangle! I know I said I would graze over the wines paired with dinner at What Happens When, but I feel like I should include this one in, if not solely for the purpose of the unique glassware used as its vessel! It looked like the bottom of an Erlenmeyer flask--you know the ones you find in chemistry class. This is a 10-year vintage tawny (i.e., a strong, aged wine) port to go with one of the desserts (i.e., the bitter chocolate bread pudding). It was a well-rounded port--very concentrated flavor of grape. Marcus, John P., and I had the bitter chocolate bread pudding served with strawberries and root beer. The root beer appeared as brown-ish, translucent droppings on the plate, adding a nice twist to a chocolate-laden dessert. The chocolate in this dish wasn't very fragrant or bittersweet in flavor--it was definitely more on the bland side. It wasn't a horrible dessert, but it wasn't the best--not super impressive. 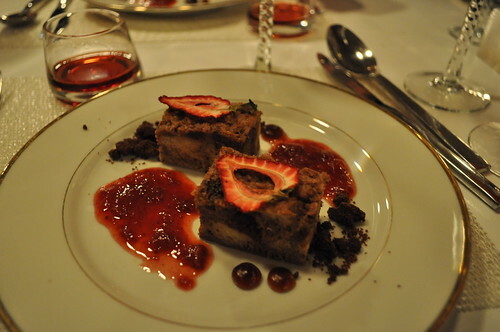 The strawberry sauce salvaged the dessert's overall taste. 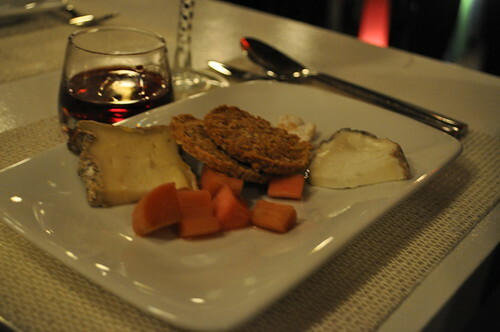 Linda went with the cheese plate, which had two types of cheeses: Monte Enebro (i.e., pasturized goat cheese) from Castilla y León, Spain and Tomme Crayeuse (raw cow's milk cheese) from Rhobe-Alpes, France. If I recall correctly, she enjoyed this! 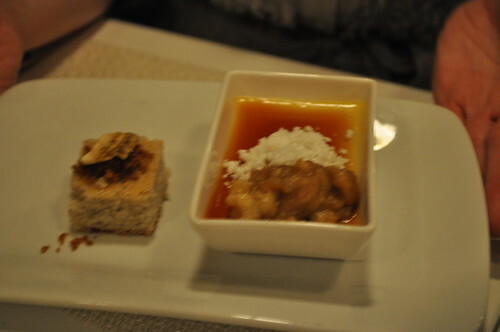 Jess and John S. had the banana's foster crème brûlée with brown butter and dark rum. I remember saying that it was pretty good as well. 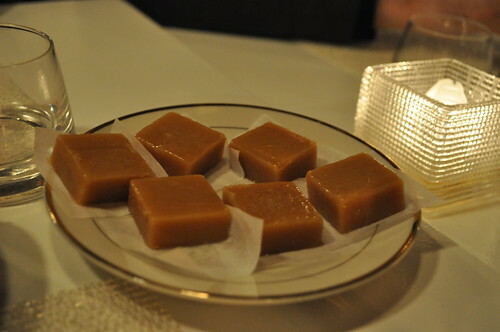 The restaurant concluded dinner with a small mignardise of bourbon caramels. Findings: The concept, story, and philosophy behind What Happens When is fascinating and a very innovative idea. While it is, in theory, a "pop-up" restaurant--both fleeting and temporary--I believe it to be a little more than that in practice. It is an installation of art and exhibition of creativity that physically changes every month. It embraces the same ideas Chef Grant Achatz and Nick Kokonas have for their newly embarked culinary venture of Next, a restaurant that is about "constant exploration" every three months of a new geographical location at a specific point in time (past, present, or future). I think they did a great job transforming the space as an ode to the origins of American Jazz. One thing I would improve upon would be the acoustics of the space. Maybe it was intentional, but I did feel like the restaurant was very energetic in chatter, which caused us to all be shouting a bit over each other in order to be heard. As the restaurant filled up as the night went on, we could also barely hear the music crafted for the restaurant's soundscape by Mr. Riddle--something that I think is important to the entire experience at What Happens When. As for the cuisine, I think Chef Fraser did many things well (the fried boudines, soft shell crab, crawfish bisque, jambalaya) and the others were mediocre. 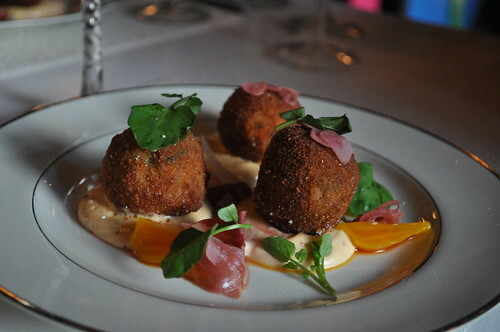 For cuisine that is entirely influenced by the area of New Orleans and its bold cajun flavors, it didn't seem clearly evident in the flavors that were exhibited in Movement No. 4's menu items that we had tried. While the menu certainly pays homage to traditional cajun foods and dishes (po' boys, boudines, crawfish, jambalaya, muffuletta, gumbo, dirty rice, etc. ), the expectation of a little more umph from the dishes--perhaps more flavor and spices native to the area--was even greater. The letdown was a bit disappointing, but the food was still pretty good overall--just without a huge "wow"-ing factor. In summary, I would say that the experience was a great one--can't really go wrong with a solid group of people who like to catch up over some good food and wine. The spirit of What Happens When definite made its round over our dinner that night--energetic and excited. Perhaps there will be an opportunity to make an appearance for one of the remaining five movements, depending on how alluring their concepts may be--hopefully the food will be a little bolder and louder in taste and flavors! But major credit to Chef Fraser and the design team at What Happens When for creating such an interesting and captivating idea for a restaurant without being at all pretentious--I really admire the understated beauty of the space and the décor that was tailored to it. 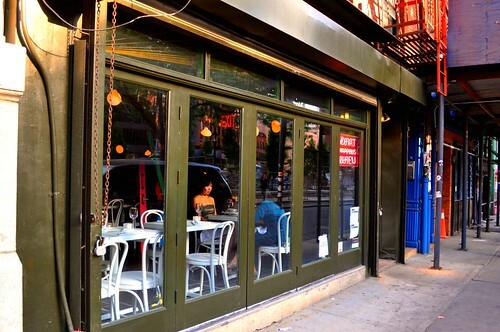 It will be sad to see What Happens When leave New York City--yet another pop-up restaurant will bite the dust, and only those who were lucky and fortunate to have a taste of it will be able to tell the world about the missed meals! Price point: $58 per person, additional $35 each for wine pairing.